It's the end of peach season but there are still some good ones that can be found in the store. This tart is a lovely way to use them and feature their bright and sweet flavor. Summer fruits are so much fun to sprinkle on tarts and other desserts. Once fall comes then everyone starts turning to baked pies and cobblers. I've been seeing more and more apple recipes popping up online, including some apples stuffed with cinnamon, sugar, and raisins that are cooked in a slow cooker. That sounds good to me to about now. I've been trying to bake fall desserts recently hoping that maybe I can pretend the weather is colder (it's not really working) so I thought I would go ahead and make a summer dessert, you know, since it's almost over now. I would say this is an easy recipe, but it's not necessarily a quick one. You could make the pastry cream the day before though and have it in the refrigerator and that would speed things up. Then all you would need is to bake the crust and cut the peaches, that would be pretty quick. I also used vanilla bean paste so that the pastry cream had the lovely specks of vanilla. Another good thing about this tart is that even if you leave it in the refrigerator over night (covered) then the crust (for me at least) didn't get soggy. I was pretty excited about that. The crust does have a snap to it so if you want a soft crust then this isn't for you but if you like the crisp crust with your tarts then you found a good one. Happy Baking! 1. Prepare the tart shell by whisking the flour, sugar, and salt together in a bowl. Add in the vanilla extract and the butter, then stir until the dough is mixed and soft. Press the dough onto the bottom and sides of a 9” tart pan. Chill the dough in the pan for 30 minutes. 2. While the dough is chilling, preheat the oven to 375F. Place a sheet of parchment in the tart pan and top with pie weights (or dried beans). Bake about 20 minutes until the dough starts to turn golden on the edges, about 20 minutes. Take the pan out of the oven and remove the parchment and pie weights. Using a fork prick holes in the crust then continue to bake until the entire crust is lightly browned, about 10-12 minutes. Cool completely. 3. Mix the sugar and egg yolks together in a medium, heatproof bowl. Soft the cornstarch and flour over the egg mixture then mix together until the mixture is smooth. 4. Bring the milk to just boiling in a saucepan, then remove from heat and temper a little at a time into the egg mixture while whisking the egg mixture constantly so it will not curdle. Strain the pastry cream into a clean saucepan..
5. Cook the pastry cream mixture over medium heat, while stirring constantly, until it is boiling, then cook an additional 30-60 seconds until it is really thick. Stir in the vanilla extract or vanilla bean paste. Pour the mixture into a clean bowl and cover with plastic wrap on the surface to that a crust does not form while it is cooling. Cool the mixture to room temperature. Refrigerate if the pastry cream is not being using directly after cooling. Before using the mixture stir it to remove any lumps that formed during cooling. 6. Evenly spread the cooled pastry cream mixture into the cooled tart crust. Decoratively lay out the peaches on the pastry cream. Refrigerate if not serving immediately. Ooh, this looks good. 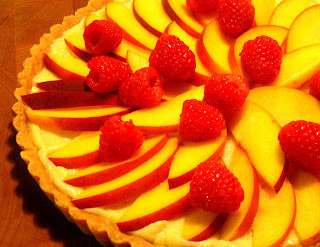 I've got some peaches I bought at the farmer's market a few days ago that need to make their way into a dessert like this. It's an amazing looking tart! 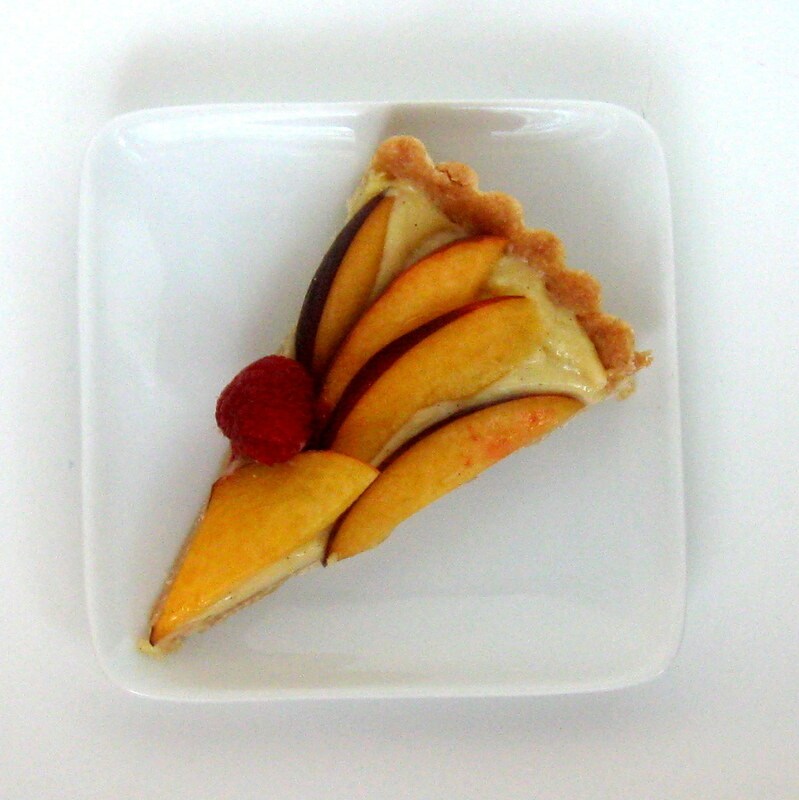 I have never made a fruit tart but yours look impressive! Hi! This looks absolutely delicious! I found you at the Chef-In-Training's Link party and would love for you to share them at my link party at http://mommyssweetconfessions.blogspot.com/2012/09/sweet-confessions-sunday-link-party-6.html . See you at the party!